When Dominic, my youngest son, was 10 weeks old, he was diagnosed with a cancerous mass on his brain, spinal column and central nervous system. Doctors told us it was extremely rare and unlikely to be treatable - they said he probably only had three weeks to live. No parent ever expects to go through a scenario like this. Actually, being there, holding your very sick baby, when those words are spoken, is totally surreal and such random thoughts go through your head that it’s hard to share your initial emotions with anyone, for fear of being judged. My initial thoughts ranged from anger at the thought of having to spend more time in this noisy hospital, away from Zach, my other very young son, and despair at the thought of him going into school without having had his uniform ironed correctly. Looking back now I see that these crazy thoughts were my mind’s way of protecting me from having to process the whole, horrible, too-desperate-to-even imagine situation, all in one go. The few weeks that followed were extremely difficult and I had to juggle a whole range of emotions on very little sleep and with a small support network. My husband wanted to keep things as normal as possible for Zach at home so often stayed with him in the evening. With no one in the hospital I knew, I felt very alone during those first few days and weeks. It was also hard to have any sense of privacy as Dominic’s health care was 24/7 and my role as primary carer for my baby was removed from me as his little body required regular medication and checks from the medical team, rather than his mummy. This was one of the hardest things to bear. Every parent wants to be the primary source of comfort and reassurance for their child, but I was helpless to give him relief from his pain and had to hand over this role to strange nurses and doctors. I stayed with him in hospital for the next five months - he couldn’t leave the ward at all. I felt so isolated. For the first 10 weeks of Dominic’s life, I had chatted happily with friends and acquaintances about lovely things to do with new babies. Despite the fatigue of those first few weeks, I had thrived on the lovely comments I received about my beautiful, smiley baby and had felt immensely proud of my two gorgeous boys. Suddenly, my days were governed by the hospital ward and Dominic’s treatment and there were few familiar faces. In the darkest hours, at night when the other children were sleeping, I often felt despair at what life had thrown at me and the unfairness of it all. CLIC Sargent referred me to Rainbow Trust Children’s Charity and Vicky, a Durham based Family Support Worker, visited Dominic and I in the hospital once a week. That gave me a few hours to grab a shower or get off the ward and relish the outside air. When you are living in hospital with a very sick child, you are desperate to get out and experience a bit of normality. However, despite the draw of normal life outside the ward, you loathe to leave your child with anyone because you know that no-one else will give them the same level of care and attention. Although the nurses often offered to watch Dominic whilst I popped downstairs to grab a coffee, I knew that if an emergency came up, their priority would not be my child. Rainbow Trust Family Support Workers step in like an emergency parent and I knew that whatever happened, Vicky would be with Dominic and look after him as well as I would. The time-out allowed me to get off the ward without the worries of leaving my baby and to recharge my batteries which helped me care for my child long-term in that situation as it helped alleviate my anxieties and helped me feel more positive. Zach struggled not having me around while I was in hospital with Dominic. I told him he could talk to me about anything that was bothering him to which he replied, “I can’t mummy, you’re never here because you live in the hospital.” It broke my heart not being with Zach as he is a natural worrier and always wanted extra cuddles at nighttime. He had also just had to make the adjustment from being an only child for five years, to suddenly being a big brother and I imagine he found this quite difficult as he’d grown accustomed to having my attention all the time. To suddenly be thrown into a situation where his new brother, whom he adored, was very ill, and to have his mummy leave home for a length of time, must have seemed very daunting to a little boy. 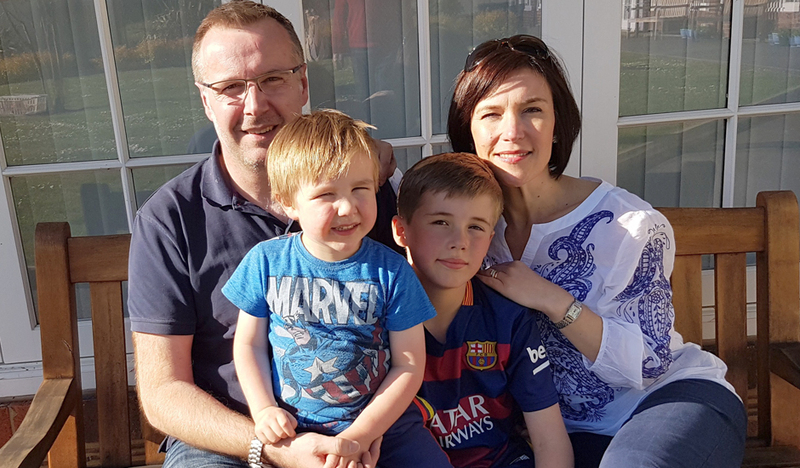 In those five months, Dominic had intense IV chemotherapy and against the odds, the tumour reduced in size. We were finally allowed to take him home and return to the oncology clinic on a regular basis for oral chemotherapy. Although we were happy to be home with Dominic, we had to balance this with the anxiety of not being near medical help and, although the five months on the ward had been difficult, it felt somehow, like we had lost our safety net. Additionally, it was hard to manage the demands of Zach, who was thrilled to have his mummy home, with the health needs of his baby brother. I felt like I was never fully able to give 100 per cent attention to either child. I’m sure many parents of more than one child feel like this but, for me, this was especially prevalent because I felt like I needed to give extra love and reassurance to Zach but equally, I needed to give more time to Dominic to ensure his medical care was given correctly. Vicky took Zach on days out and to Rainbow Trust drop in groups where he met and talked to other children and families in similar situations. He knew his family life wasn’t normal, so Vicky let him do things he loved which helped him feel more normal. Knowing Zach was with someone I trusted, was hugely comforting. Vicky worked with many families in similar situations and I knew she’d listen to Zach and maybe be able to offer him comfort and reassurance in a different way to me. With her, he was her number one priority and he could have fun. Zach being with Vicky allowed me to give 100 per cent attention to Dominic without feeling like I was depriving his brother. Rainbow Trust Family Support Workers are like having an extra family member. They offer support in whichever way you need it. Most importantly, they carry out the work they do without any sense of judgment. Unlike friends or family members who have never experienced a similar situation, they just seem to get it and having someone there who genuinely understands and cares about you, your children and your situation, is simply amazing. Obviously, the anxiety of having a sick child is never fully removed but having a team like Rainbow Trust helps relieve some of the stress and often helps the parent of a sick child gain a fresh perspective of the situation which can make a huge difference to the emotional health of a family.